The preschool program at our Childcare Center in Irvine, California provides your little one with the opportunity to continue building and learning from their toddler experiences through our specially structured activities. Rest assured that your child will grow from an infant to a toddler to an independent preschooler. We believe that fun and education activities can become the stepping stones for your little one’s preschool educational success. So, we tap into language, science, math, dramatic play, music, arts, and crafts activities to expand their knowledge and skills. 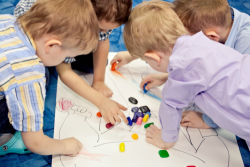 In our Preschool Program in Irvine, your child will be introduced to cognitive skills, such as matching and sequencing; social skills in terms of similarities and diversity; and language art skills of storytelling and writing. We see to it that they are able to develop self-help, self-confidence and practice decision making, responsibility, and manners.